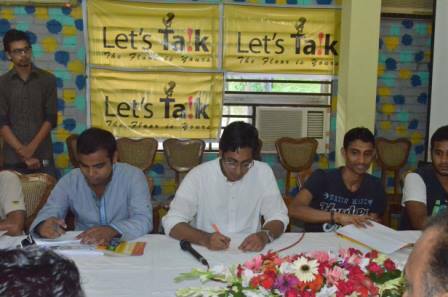 After successful completion of three Let’s Talk events, the 4th session was held at Dingi Restaurant, Dhaka on 21st July, 2013. Nahim Razzaq MP and Tanvir Shakil Joy MP, two youngest MPs of 9th parliament, were present at the event to interact with the youths present. The introductory session was followed by a presentation made by Centre for Research & Information (CRI). In the spontaneous question and answer session, students asked about socio-political aspects and problems that they see in front of them and for the country. A student from UIU asked about the opportunities and availability of research funds in ICT sector. One participant, who is involved in farming asked about the fertilizer pricing issue and storage facility. Registration of Hindu marriage, women’s education, recent Hefazate Islam protest and condition of women’s rights were some of the topics brought up by the participants. About the proposed nuclear power plant deal with Russia, the MPs told the participants that it is the safest possible solution for Bangladesh right now. Coal and gas are not renewable sources of energy and sooner or later will run out. So, the government is looking for the best possible alternative options. They admitted that this government, just like all other governments of the world, did have some flaws, but they are still trying their best to ensure accountability. Students praised the initiatives taken by the government such as e-tendering, e-postal system which has changed the scenario for many. Also they congratulated the government for achieving some of the MDGs. One participant pointed out that now his sister gets the books within the first week of January every year. He also praised the government for giving more focus on woman education. f)	Sound pollution emanating from horns of large vehicles. Tanvir Shakil Joy in his concluding remark urged the participants to do criticism of the government’s work in a constructive way because many of the MPs do work hard to ensure peace and prosperity in their constituency. He thanked CRI for organizing and the participants for their contribution in the event.